Ordovician News No 36 compiled by Ian Percival is now available for download. 13th International Symposium on the Ordovician System will be held from July 19th to July 22th, 2019 in Novosibirsk, Russia. Full details are available on the conference website: http://isos13.ipgg.sbras.ru and in the Third Circular. We are now into 2019, which means that you are receiving my annual request for research reports covering 2018, to be compiled and published as Ordovician News Number 36. 2019 is a significant year for all Ordovician research workers, as the 13th International Symposium on the Ordovician System (13th ISOS) will be held in Novosibirsk, Russia, during July. The ISOS is held every four years, and is the major global conference for Ordovician specialists to present their research and hear the latest advances in Ordovician studies from their colleagues. DEADLINE for receipt of your contribution to Ordovician News Number 36 will be February 28, 2019. I anticipate that the Newsletter will be distributed in March 2019 (early April at the latest), depending on when the Final Circular for the 13th ISOS is ready for inclusion in Ordovician News. You are welcome to include information on your research activities covering all aspects of the Ordovician System, plus a list of publications that appeared in 2018 in print or online that have not been included in previous issues of the newsletter. Please do not include manuscripts that are in prep, in review, or have not yet been formally accepted by journal or book editors. Note that I reserve the right to omit articles that deal exclusively with topics and geological systems not related to the Ordovician. This is because the publication lists compiled in Ordovician News are used to indicate and compare the amount of research activity on the Ordovician that is being generated year to year. Bergstrom, S.M., Chen Xu, Schmitz, B., Young, S., Rong Jia-yu & Saltzman, M.R. 2009. First documentation of the Ordovician Guttenberg δ13C excursion (GICE) in Asia: chemostratigraphy of the Pagoda and Yanwashan formations in southeastern China. Geological Magazine 146, 1-11. Personal contact details – again, check recent issues of Ordovician News for the information needed about your contact details. If these have not changed from last year, please still supply them (perhaps just copy them from Ordovician News 35). Any contributions dealing with matters of debate about the Ordovician System are also sought. 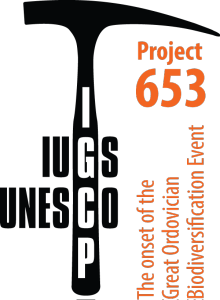 Notification of new projects (both national and international) and upcoming events (international symposia, conferences and congresses) relevant to the Ordovician System will ensure that these important gatherings are brought to the attention of potential attendees. Reports of meetings held in 2018, articles regarding awards to researchers, and obituaries, can also be contributed. Illustrations should be sent as attachments in JPEG or TIFF formats, not more than 5 MB in size. If you know of anyone, such as new students, who might not be on the mailing list for Ordovician News, please forward this message and encourage them to contribute a summary of their contact details, research activities, and any publications. The second annual meeting of the International Geoscience Programme Project 653 “Filling the gap between Cambrian Explosion and the GOBE” will be held in Yichang, China from October 8 through 18, 2017. Oct. 8 (Sunday), 2017: Arrival, registration (ice breaker). Oct. 9 (Monday), 2017: Oral and poster presentations. Oct. 10 (Tuesday), 2017: Oral and poster presentations, workshop. Oct. 11 (Wednesday), 2017: Mid-conference field trip. Oct. 12 (Thursday), 2017: Oral and poster presentations, conference banquet. Oct. 13—Oct. 18, 2017: Post-conference field excursion in Hubei and Hunan Provinces. Indoor sessions will be held in the Taohualing Hotel, Yichang City, Hubei Province, China. The mid-conference field trip will visit the Furongian to Middle Ordovician successions, the GSSPs of Dapingian and Hirnantian stages near the Yichang city, and a few historical and scenery sites of Yangtze Gorges. The post-conference excursion will investigate a number of classic sections of the Guzhangian (Series 3, Cambrian) to Upper Ordovician around the Yangtze Gorges area. Dr. ZHANG Yuandong (Nanjing Institute of Geology and Palaeontology): ydzhang@nigpas.ac.cnDetailed costs and registration information will be posted in the second circular distributed on April 1, 2017. In the past 16 years, there have been tremendous advances in understanding of the Cambrian-Ordovician boundary on the basis of the study of the GSSP fixed at Green Point, Newfoundland in 2001. New discoveries and knowledge of fossils (conodonts, graptolites, trilobites etc. ), radiometric dates and chemo-stratigraphic data have been published at an unprecedented pace. In the meantime, because each research group has been working more or less independently, there have been numerous discrepancies and inconsistencies with regard to important biomarkers of the Cambrian-Ordovician boundary and its relation to chemostratigraphic excursions, and sequence stratigraphic surfaces. This workshop is motivated by the need to resolve these discrepancies and to discuss the feasibility of re-defining a set of criteria for subdivision and correlation of the Cambrian-Ordovician boundary, in China and beyond. The workshop, supported by NSFC and Ministry of Science and Technology of China (NCSC), will be organized by National Commission on Stratigraphy of China (NCSC), Jilin Provincial Bureau of Land and Resources (JPBLR) and Wuhan Center for Geological Survey (WCGS) (Institute of Geology and Mineral Resources (WIGMR) and hosted by the Research Center of Paleontology and Stratigraphy (RCPS) of Jilin University together with Baishan City Bureau (BCBLR) and Jiangyuan District Bureau of Land and Resources (JDBLR). It will be held from 20-25 September, 2017 at Jilin University, Changchun, NE China. A full two-day in-door meeting will cover all aspects of research on the Cambrian-Ordovician boundary, and the following field excursion of three days will travel to Jiangyuan area of Baishan City to examine the Dayangcha section (potential GSSP for the Cambrian-Ordovician boundary) and another relevant sections nearby, where participants can discuss and identify critical problems that need to be resolved and evaluate possible criteria for subdivision and correlation of the Cambrian-Ordovician boundary. It is hoped that our efforts will better coordinate the development of tools and criteria for study of global Cambrian-Ordovician boundary sections.